The quilt was made on the Greek island of Lefkada in 1965 by a quiltmaker whose name is not known. It was ordered by Evangelea Politis as a gift for her daughter-in-law in Australia. It is not used now. This lovely satin quilt originated in Lefkada, one of the beautiful Ionian islands on the western side of Greece. In 1965, Evangelea Politis, had it specially made as a gift for her daughter-in-law Maria, in faraway Australia. Almost directly in line with Lefkada, on the eastern side of Greece, is the island of Mytilini (Lesvos) and the village of Aghia Paraskevi, which Maria Politis left in 1960, to join her brother Andoni who had come to Australia three years earlier. There were five children in Maria's family, growing up during the 'pinna' (hunger or famine), the time of the WW2 German occupation. These were times of great hardship and starvation, and families all over Greece were struggling to survive. 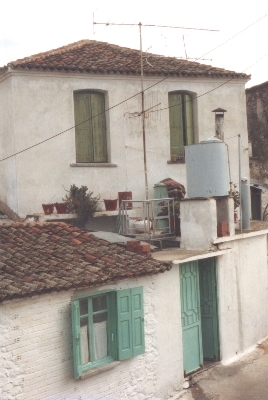 Maria's father, Costas Mimelli, planted tobacco, a longtime staple crop in Greece. Maria remembers, as a nine-year old, working in the fields with her sister Eleni. She worked with her father for many years before migrating to Australia. Maria met and married her husband Aleko in Broken Hill, NSW, where they had several good friends who had also come from Mytilini. After a few years they moved to Canberra where they worked hard and gave their children Theodoros and Raylene, a good education. Maria, a widow now for many years is grateful for her supportive, close-knit family. Her 'paploma', still in its original, excellent, condition remains as a symbol of a life interwoven with sadness as well as happiness." Wholecloth quilt made of gold satin with a backing of beige coloured cotton. The padding is wool. The quilting pattern is an all over diamond pattern, framed in a border of straight and wavy parallel lines. It is hand quilted. Wholecloth quilt, the cover made of blue and red paisley cotton cretonne, and filled with feathers. The cover is reversible. 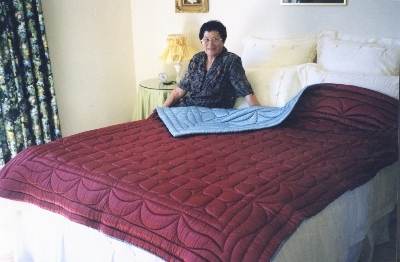 The machine quilting is a simple pattern of 2 diamonds, one within the other, in the centre, with 3 rows of stitching around the edge of the quilt, forming a wide border. Red Applique on an off white background. All applique is by hand using herringbone stitch. Three different red materials are used for the applique each printed with a different tiny all over pattern. There are 3 different applique shapes: the 9 major shapes have 8 points; the daisy pattern has 8 petals; the edge pattern is used along the top, left and half of the bottom edge of the quilt and sometimes has 4 points, sometimes 3 and sometimes 2. 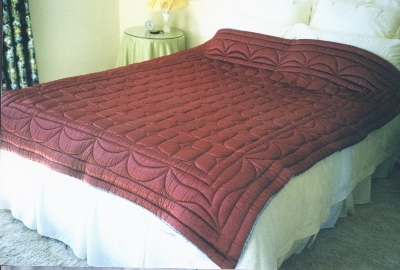 There is a tiny red piping around the quilt along the bottom and both sides. It is hand quilted in 100mm long zig zags 12mms apart all over the quilt. The quilt is signed twice on the front, once in ink and once in embroidery. It is signed 'Anna Edwards Jan 1858'. There is no padding and the backing material is similar to the off white background material of the top.